Left : Elizabeth Catherine Howard. She was the 4th Countess of Carnarvon from 1878 -1890. After this she became the Dowager Countess of Carnarvon. She died in 1929, in Italy. 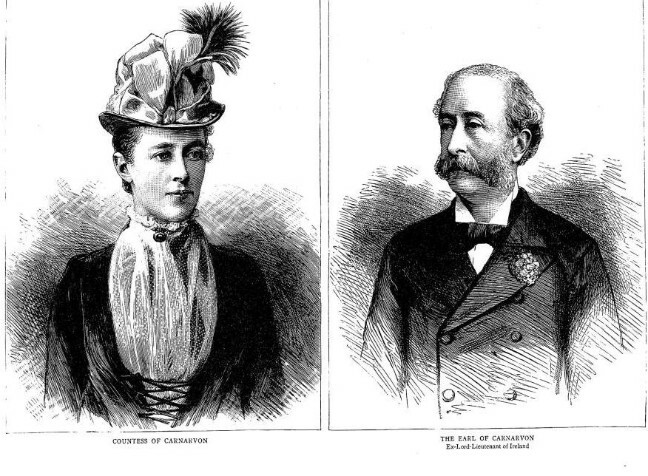 Right : Henry, 4th Earl of Carnarvon. He died in 1890. His first wife, Lady Evelyn Stanhope, died in 1875, from the effects of child birth. Elizabeth and Henry were cousins. At the outset the research was focused on revealing Elsie’s role as a maverick hospital organiser in Egypt in the Great War. The Countess was given special powers to visit all the hospital ships coming into Alexandra from the killing fields of Gallipoli. It was described by Elsie as “chaos”. And she describes the battle for the beaches of Turkey as “the charge of the 600 over and over again”. That horrific story will be revealed by Cross in his new book “ Lady Carnarvon's Nursing Homes: Nursing the Privileged in Wartime and Peace" to be published in 2011. As a result of the researches much more material has been found to be of merit. A fascinating picture of Elsie’s close knit relationships has emerged. This is especially worth revealing between her and the members of her own family, but also in respect of the family she inherited from her husband’s first marriage, including a trio of ultra-curious women, Ladies Winifred, Margaret and Victoria Herbert, who all had strange aristocratic idiosyncrasies. Elsie’s relationship with her own two sons, Aubrey and Mervyn is already well known and recorded in the public domain, but her constant struggle to bring round her stubborn step son, George, Lord Porchester ( who later became the 5th Earl of Carnarvon of Tutankhamun fame) is hardly known about at all and is a compelling tale. That story will be revealed by Cross in his book “ Lordy” , all about Tutankhamun's parton, Lord George Carnarvon, a critical and long overdue retrospective on the 5th Earl of Carnarvon, to be published in 2012. The book's launch will tie in with the 90th anniversary of the discovery of the tomb of Tutankhamun, in November 2012. William Cross, FSA Scot, is the author of " The Life and Secrets of Almina Carnarvon", a candid biography of Almina, 5th Countess of Carnarvon, published 22 April 2011 and launched on 20 July 2011. For reviews of the book please click below.